On February 15, Tedeschi Trucks Band and Fantasy Records will release ‘SIGNS’, their 4th studio album and a new high-water mark in their recording career. With 11 originals penned by the band and a few dear friends, produced by Derek Trucks, Jim Scott and Bobby Tis and meticulously recorded to two-inch analogue tape for the first time, SIGNS reflects on the losses suffered by the band in the past few years while still finding cause for hope and celebration in the beauty of life and nature. In celebration of SIGNS we’re also excited to announce a special album release concert at Brooklyn Academy of Music on February 20th. The band will be headlining in London at The Palladium on April 26th and 27th. We are delighted to announce that The Southern Companion will be releasing their new album “Shine A Little Light” on 25th January 2019 on their own label, Eleven33 Records. Pre order will be available from 21st November 2018 and when purchased digitally you will receive "Songbird" as an instant gratification download. The band will be supporting the release with their first UK headline tour during February and March 2019. Dates to be announced shortly. Fronted by singer/songwriter and guitarist Darren Hodson, The Southern Companion are made up of some of the UK’s finest session musicians , some of whom first met in the music room at school. Their CV’s include industry big hitters Tom Jones, Take That, Mel C, Lulu, Rumer, James Morrison, Pete Townsend, Dire Straits, Amy MacDonald, the list goes on and on. After recording an “Under The Apple Tree” session for Bob Harris in 2016, an appearance at the C2C festival in London soon followed and a string of UK festivals that summer brought The Southern Companion firmly into the hearts of Country & Americana fans. 2 years of UK, European and USA tour dates came next supporting songstress Rumer and 60’s legend Lulu. Multiple British CMA Awards, Live shows for The AMA-UK, National air play on BBC Radio 2 from Bob Harris, as well as a featured song in the upcoming smash hit movie “Wild Rose” feat. Jessie Buckley & Julie Walters, 2019 looks set to be a big year for the band. NASHVILLE, TN / LONDON, UK — “One of the most inspiring tales to come out of Music Row in the last decade,” (CMT) Jimmie Allen has announced the hotly-anticipated details surrounding his debut album,‘Mercury Lane’, available everywhere October 12th 2018 via Stoney Creek Records / BBR Music Group, just in time for his forthcoming first UK tour dates. After teasing the track listing and behind-the-scenes photos on his socials earlier this week, the "Best Shot" singer just revealed the artwork, name, meaning and additional details for his first full-length album along with a brand-new song. As an homage to the origin of his story and how far he’s come, the soul-baring album takes its name from the street Allen grew up on and pays tribute to the influence home and family has had on his incredible journey. Fans will instantly receive six songs with a pre-order of ‘Mercury Lane’, including “Best Shot,” “Underdogs,” “21,” “Warrior,” “Back of Your Mind” and “Make Me Want To,” a brand-new track that highlights the singer’s hopeless romantic side. For months Jimmie Allen fans had been teased with the promise of a full-length album; hoping to satiate the craving for new music, the critically-acclaimed rising star had been sharing one brand-new track each month as a collection of songs he calls the “Slower Lower Sessions.” The series, inspired by the ‘Slower Lower’ region of the state, held fans off temporarily but it is clear that after teasing ‘Mercury Lane’ details on his Instagram story earlier this week, people are excited for more Jimmie Allen. 'Mercury Lane', produced by Ash Bowers and Eric Torres is available for pre-order here: https://jimmieallen.lnk.to/mercurylane. Hot off of a busy summer on the road, gaining new fans at festivals across the country, Jimmie will hit the road again in support of Scotty McCreery and Kane Brown’s tours as well as take his live show to the UK alongside labelmate, Chase Rice. For tour details and more information, visit www.JimmieAllenMusic.com. The epitome of the phrase “persistence pays off,” Jimmie Allen laid it all on the line to make his dreams a reality. Now signed to BBR Music Group’s Stoney Creek Records, with his debut single “Best Shot” in the Top 20 and climbing, Jimmie Allen is set to make his full-length album debut with Mercury Lane, featuring a cutting-edge mix of country, rock, R&B, and pop produced by Ash Bowers and Eric Torres. The Southern Delaware native’s talent for songwriting is undeniable, having written a song that was featured in a Super Bowl commercial and appeared in a Diet Coke ad with megastar Taylor Swift. “Blue Jean Baby,” off his debut self-titled EP, immediately caught the attention of country music fans and critics alike with its soulful groove— rocketing it to the top of digital playlists, across all genres. Allen is currently introducing his music at festivals across the country before sharing the stage with Chase Rice, Kane Brown, and Scotty McCreery this fall. The hot newcomer has already been heralded as one of the top “artists to watch in 2018” by Rolling Stone, Billboard, Pandora, Sounds Like Nashville; and has earned spots in CMT’s “18 for 2018” Listen Up program, and Bobby Bones’ Class of 2018. With influences including Peggy Lee, Eddie Cochran, Buddy Holly, The Kinks and Dolly Parton, the album features beautifully complex lyrics, sung by the sultry stand-out vocals of lead singer Bo Lucas, made all the brighter by Hayleigh King’s sympathetic and tasteful guitar accompaniment which in turn creates the cinematic backdrop of their sound. The album features elements of sixties pop, surf, garage and blues that take you from the empty and confined opener of ‘Brunswick Place’, through to the realities of love and life in ‘Maybe I Do’, to an existential crisis in ‘Shop Girl’, finishing on the dark noir obsessive ‘Nothing On You’. The duo have managed to create a timeless, but also fresh sound that is entirely their own. Upon meeting in Brighton at university, Bo Lucas (lead vocals and acoustic guitar) and Hayleigh King (electric guitar and backing-vocals) quickly cemented a musical connection, writing their first song ‘Crazy Heart’ within 15 minutes of first playing together. Their DIY approach to music saw them playing at open mic's and local shows, resulting with the opportunity to tour with and open for Ray Davies - 50th anniversary tour, back in 2014. At short notice they burnt CDs on laptops, with handmade brown paper & cardboard sleeves stuck together, hand stamped with “Lucas & King” and handwritten track listings ready for the tour. In just a few years Lucas & King have stacked up many accolades and awards; the duo were finalists in Glastonbury Emerging Talent 2017 which saw them perform on Rabbit Hole, Avalon and Acoustic stage. Then in July of this year they were crowned winners of the prestigious ‘Fender Undiscovered Artist award’, hand picked by a panel of judges from over 2000 contestants; prize including a trip to LA, with gigs at the Fender factory in Corona California. Lucas & King have also supported many respected overseas artists, such as Blind Boy Paxton, John Murry, The Americans and Colter Wall, all of whom have become avid fans of this very special duo. LCM favourite US singer-songwriter Sarah Darling is scheduled to release her fifth studio album in January 2019. You can pre-order the album along with her next single on October 26th. Having been very busy laying the groundwork for her new album with Mark Bright ((Rascal Flatts, Carrie Underwood, Keith Urban) in her hometown of Nashville, Sarah has relocated to London, where she has spent the summer working with acclaimed writer/producers Ash Howes (Kylie, Gabriella Aplin) and Pete Hammerton (The Shires, Wandering Hearts, Shane Filan) and with songwriters including Shelly Poole (Paloma Faith, Mel C, Sam Bailey) and Jessica Sharman (The Shires, Ward Thomas). The multi-award wining Cambridge based singer-songwriter Emily Mae Winters is releasing her brand new second album ‘High Romance’ through Pledge Music…and she needs your help and support. 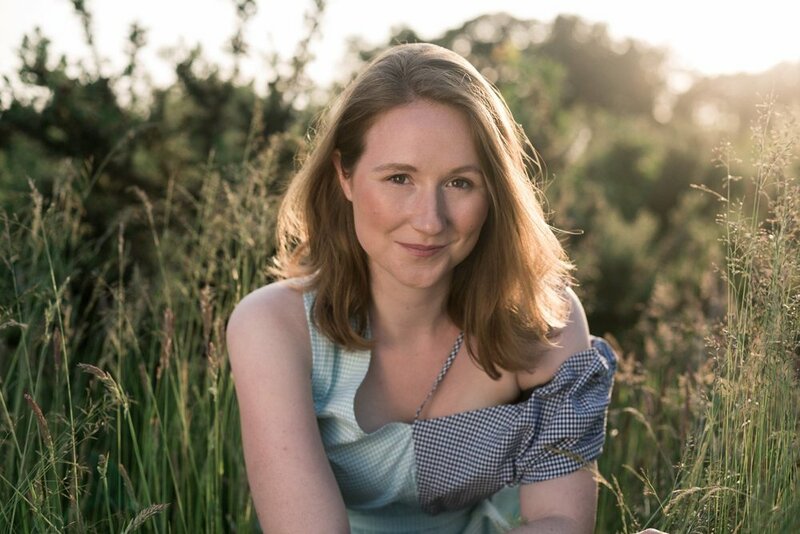 For the release Emily has also been supported by the PRS Emerging Artist Fund in association with Pledge Music as well as through EFDSS (English Folk Song and Dance Society) Creative Seed Funding. The new album will be recorded this December at London’s Urchin Studios with award winning producer Matt Ingram (Florence and the Machine, Laura Marling, Rae Morris, Lianne La Havas, Lewis & Leigh, Benjamin Francis Leftwich). The album pre-sales and other exclusives can be found at Emily’s Pledge page at the link below. Emily will also be on a UK album pre-release tour. Catch her if you can. Saskia Griffith Moore has just announced a Kickstarter campaign and pre-order for her new Scottish themed album. Ssakia will be working in Scotland with an undiscovered collective of Scottish musicians. It's one everyone here at LCM HQ is very interested in hearing when it is completed. Following a packed summer of festivals including Cambridge Folk, Buckle & Boots, and Black Deer; tour dates and radio airplay across the UK including multiple BBC radio appearances, London-based Americana duo O&O have announced the Sept 21st release of their long-awaited debut EP ‘Truth Comes Out’, and revealed the lead single of the same name, available to stream now (listen here) and to download immediately for fans who pre-order the EP. Along with the title track, this new release features a total of four brand new songs including previous single ‘Tears In The Rain’, the video for which premiered last month on The Bluegrass Situation. O&O will be showcasing songs from the new release at Apples & Pears in Shoreditch, London on Sept 14th. The EP is available to pre-order now on all platforms (Amazon / iTunes) and the single will be available to stream on Spotify soon. The London Roots Festival 24th October - 18th November (formerly The London Folk & Roots Festival) is now in it’s fifth year. It’s grown from doing 6 shows in the first year to 32 in 2017 year across various size venues such as The Palladium, Bush Hall, Union Chapel, Shepherds Bush Empire, Oslo and many more. Growing from strength to strength each year, 2018 promises to be bigger and better than ever. In 2014 David Messer having promoted roots music for a number of years through DMP UK, decided to start a festival to give a platform for new and up and coming artists to play with known and established artists and to bring the best in roots music to London under one banner. So he teamed up with his friends at National Promotion company Kilimanjaro Live and created the The London Folk & Roots Festival, a multi venue event over two weeks in Oct/Nov. It’s grown from doing 6 shows in the first year to 32 last year across various size venues such as The Palladium, Bush Hall, Union Chapel, Shepherds Bush Empire, Oslo and many more. They have changed the name this year as they feel that folk comes under roots and they have an eclectic mix of folk, country, Americana, blues, singer songwriters and world music. We are very pleased here at LCM that this festival, is becoming a great part of London’s musical calendar. If you are interesting in playing at the festival please send your info to david@dmpuk.com. Australian-born, US-based singer-songwriter-actress Clare Bowen, is releasing her debut album in the UK just in time for her first ever headline UK tour. Released on Aug 31st 2018 via BMG, the eponymous album will be preceded by the beautifully crafted single ‘Let It Rain’, which showcases Clare’s striking vocal abilities perfectly and is the album opener. ‘Let It Rain’ was debuted on the legendary Bob Harris’ Radio 2 show recently to incredible reactions. Best known for her leading role as Scarlett O’Connor on the hit TV series NASHVILLE, Clare is a gifted performer, both on screen and in a live arena setting. She returns to the UK just months after selling out the O2 London with her NASHVILLE cast mates, who also sold-out three nights at the Royal Albert Hall last year. Bowen will be releasing her debut album, produced by Brooklyn, NY’s Josh Kaufman, just before her tour kicks off at Symphony Hall, Birmingham on September 2, and tickets are on-sale now. 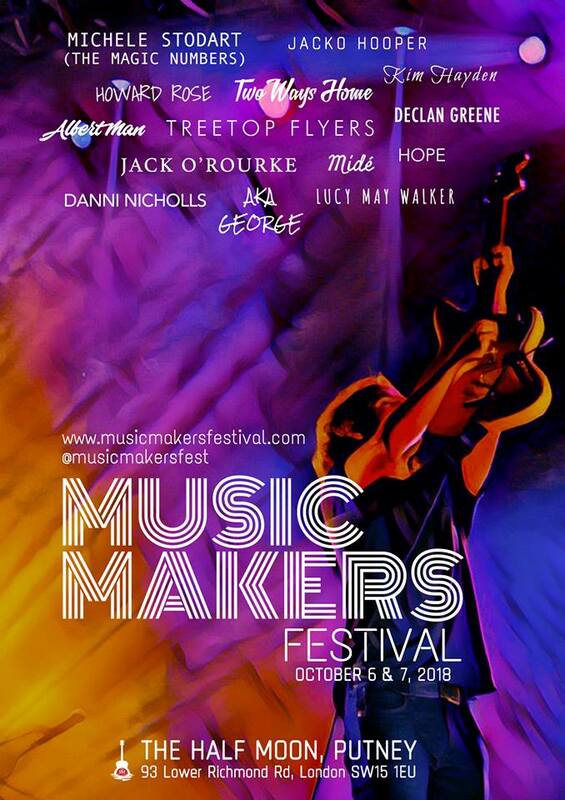 The excellent Music Makers weekend festival set for the 6th & 7th October in the wonderful Half Moon in Putney, has just announced it's artist line up and stage times. This is a super London festival, if you haven't already discovered it before. It's organised and curated by Albert Mann and Manoja Ullmann. The full review of last years event is included for you on our LCM website. This years line-up includes long term LCM favourites Danni Nicholls, Two Ways Home, Michele Stodart and Albert Mann and his band. As well as Hope, Jack O'Rouke, Jacko Hooper, Treetop Flyers, Aka George, Lucy May Walker, Declan Greene, Mide, Howard Rose and Kim Hayden. Limited 'Early bird' full weekend passes are very reasonably priced at £20. All available tickets options including day tickets are included in the link below for you. To celebrate this major anniversary, a brand new official video of the classic and iconic song “Fortunate Son” has just been released. Exciting times ahead as more announcement to follow, including a special release this autumn. Craft Recordings proudly announces the 50th anniversary of America’s greatest rock band, Creedence Clearwater Revival. It was in the summertime half a century ago that CCR, a group that would reach sky-high success while retaining a resolutely rootsy, earthbound sound, released their debut album. This marked the beginning of an incredible legacy that was formed over just four years of unbridled creative output (1968-1972). CCR's canon has become a staple in the Great American Songbook. Songs like "Bad Moon Rising," "Down on the Corner," "Have You Ever Seen the Rain," "Proud Mary," and "Up Around the Bend" have been ingrained into the pop-cultural consciousness—not just as classic rock staples, but as American standards. As the United States speeds towards another anniversary of its own on 4th July, Craft is kicking off the CCR50 campaign by releasing an official music video (the first ever) for one of the band’s most enduring classics, “Fortunate Son,” a song as vital now as ever. Beyond its anti-war sentiment, "Fortunate Son" is an anthem for the 99%ers, condensing a critique of elitism and class privilege into three simple, but powerfully defiant words: It Ain’t Me. Craft partnered with director Ben Fee (Band of Horses, The War on Drugs, The Lumineers, Aesop Rock) to give a whole new generation a visual entry point into the world of Creedence. The song already has an undeniable place in history as one of the most visceral, attention-grabbing protest tunes of the Vietnam era. With the new video, Fee extends the reach of "Fortunate Son" even further. "For me, protest right now is just showing pure positivity in the face of division and anger." Says Fee, “I wanted to highlight the community and positivity that everybody shares…I wanted to show what America feels like when you actually hit the road and drive throughout the states." In addition to the video, the half-century celebration will continue in the coming months to fill out the CCR story even further. Craft will be honouring the band’s musical legacy via a diverse array of media, products and events; including a special release coming this autumn. The fête will also provide fans with new ways to engage with CCR online–sharing their memories, streaming new content, and diving deeper into the band’s legendary history. Stay tuned to CCR50.com for more details, coming soon. In the meantime, you can dig in to more from the Creedence Clearwater Revival catalogue (and build your 4th July playlists) via Apple Music (click here for the Essentials) or Spotify (click here for This Is). Creedence Clearwater Revival’s 1968 self-titled debut album introduced the world to guitar-playing brothers John and Tom Fogerty, drummer Doug Clifford, and bassist Stu Cook, four young men out of El Cerrito in the San Francisco Bay Area. Though they emerged in a place and time where trippy psychedelic visions were the order of the day, CCR bucked the trends and instead tapped into a rich, traditional seam of American music that connected to blues, country, rockabilly, gospel, folk and R&B. While their contemporaries were unfurling mind-bending musical excursions with elaborate productions, Creedence crashed into the upper rungs of the album and singles charts with songs that wasted nary a note or word, overflowing with raw soul and unbridled energy. Although the band members were only together for four years under the Creedence Clearwater Revival appellation, they managed to accomplish more than many artists do in their entire career – they released 14 Top 10 hits, six Platinum albums, and one Gold in just four intensely prolific years, all powered by John Fogerty's gut-level growl, with Tom Fogerty, Stu Cook and Doug Clifford providing just the right kind of gritty, in-the-pocket punch to propel CCR's vision. The band's West Coast origins notwithstanding, Fogerty's voice contained echoes of everything from the Chicago blues bite of Howlin' Wolf to the Alabama twang of Hank Williams and the Memphis swagger of Elvis Presley, creating an archetypal example of Americana decades before anybody ever thought of using that term to define a musical genre. For all the indelible guitar hooks and commanding vocals the CCR catalogue contains, their songs are more than catchy tunes. CCR was a people's band in more ways than one; hand in hand with the accessibility that made their music relatable to just about everybody, there was a strong sense of identification with America's common folks, the ones whose stories were told in the songs. On tunes like "Born on the Bayou" and "Green River," Creedence harnessed the sonic hoodoo of almost dangerously deep, “swamp rock” grooves to propel vivid New Orleans imagery. "Long As I Can See the Light" floats luminously with the kind of sanctified soul feel that we've come to expect only from the South. And the spry country two-step of "Lookin' Out My Back Door" finds its feet in Nashville, at least in a spiritual sense. While CCR's signature song, "Proud Mary," is a Southern-soaked riverboat travelogue, with stops in Memphis and the Crescent City. Even some of the covers of Creedence's tunes have become part of history—Ike & Tina Turner's sped-up, R&B-slathered 1971 recording of "Proud Mary" almost rivaled the original in popularity. And an astonishing array of artists, from Johnny Cash and Willie Nelson to R.E.M. and the Ramones, have recorded "Have You Ever Seen the Rain," to home in on the reach of just one of their profusely covered songs. The group also performed a historic headlining set at Woodstock, and toured the world before disbanding in 1972. CCR's music endures today – still in popular rotation on the radio, and heard regularly in films and TV shows. Having sold over 30 million albums in the U.S. alone, Creedence received a rare Diamond certification from the RIAA in 2016, marking 10 million units in sales for their 1976 compilation album, Chronicle: The 20 Greatest Hits. The appeal of Creedence Clearwater Revival isn't tied to any one era or milieu; whether it's 50 years ago or 100 years from now, all you need is a pair of ears to pick up on their sound. As John Fogerty once sang on a certain 1969 hit single, "Over on the corner there's a happy noise/People come from all around to watch the magic boys." 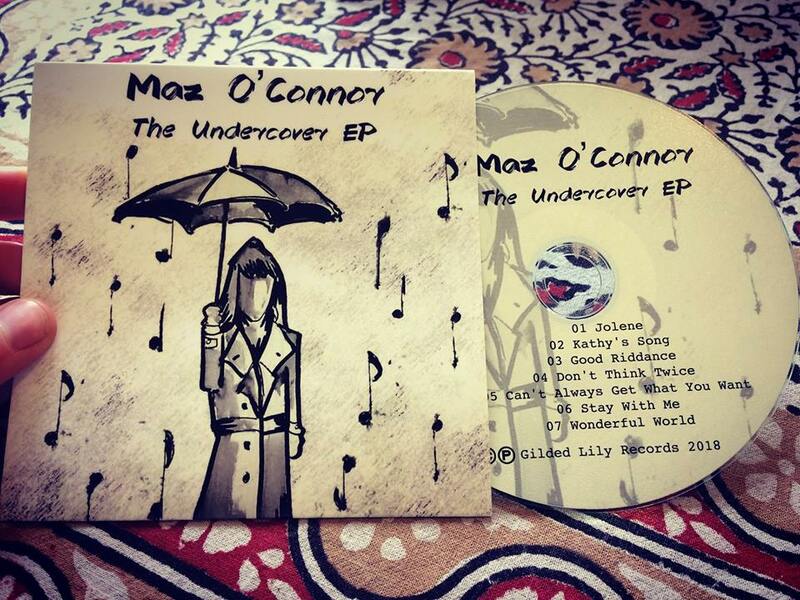 One of our favourite London based singer-songwriter Maz O'Connor is set to release a collection of cover songs in a very special limited edition EP entitled 'The Undercover'. This seven track extended EP will be available exclusively from Maz on her upcoming UK tour days. The beckon call of live music, complimentary Jack Daniel’s and an immersive multi-sensory experience will entice Waterloo Station travellers to delay their evening commutes and take a brief holiday in Tennessee at a special exhibit entitled “The Sights & Sounds of Tennessee” from 4th-17th June 2018. The exhibit is part of a month-long campaign featuring the Tennessee destinations of Nashville, Memphis and Knoxville that follows British Airways’ introduction of its five-days-per-week nonstop service from London Heathrow to Nashville, the capital city and centre to the state. The Sounds of Tennessee exhibit at Waterloo and digital boards throughout London are to feature custom Spotify playlists that will serve as a formal invitation to British holidaymakers to visit Tennessee, one of the world’s top travel destinations for music lovers. A special kick-off event, featuring Nashville recording artist Gill Landry, formerly of Old Crow Medicine Show, and AMA UK Artist of the Year Yola Carter, will take place at the exhibit on Monday, 4 June from 2 p.m. and include remarks by a Tennessee Department of Tourist Development representative. Tennessee, located in the Southeastern United States, is the birthplace of seven different forms of popular music—blues, bluegrass, country, gospel, soul, rockabilly, and rock ‘n’ roll—and has more musicians per capita than any other place in the world. Tennessee is also home to world-renowned music attractions including Beale Street, Bijou Theatre, Bluebird Cafe, Blues Hall of Fame, Country Music Hall of Fame and Museum, Graceland, Grand Ole Opry, Sun Studio, Ryman Auditorium and Tennessee Theatre. ‘Sights & Sounds of Tennessee’ visitors will stand atop a map of Tennessee and use headphones to listen to music recordings and other sounds one can only experience in Tennessee. Corresponding websites, accessible via mobile devices, enable visitors to virtually transport themselves to Tennessee destinations with 360-degree videos including a scenic vista overlooking the Great Smoky Mountains or one of the many blues clubs lining Memphis’ famous Beale Street. On 4th May, the first new LHR - BNA flight (British Airways Flight 223; a Boeing 787-7 Dreamliner carrying 200 passengers) left London’s Heathrow Airport (LHR) at 1545 local time and touched down at Nashville International Airport (BNA) eight-and-a-half hours later, initiating a five-days-a-week nonstop service from the United Kingdom to Tennessee’s capital city. ‘The Sights & Sounds of Tennessee’ exhibit is a joint effort led by the Tennessee Department of Tourist Development, working in partnership with BrandUSA, the Nashville Convention & Visitors Corp., Memphis Convention & Visitors Bureau and Knoxville Convention & Visitors Bureau, to formerly introduce Tennessee to Londoners through an interactive sight and sound experience in London’s Waterloo Station. For more information please visit: www.tnvacation.com. A excellent London blues festival is taking place in London from May 29th to June in various location around town. Organised by DMP UK and our friend Joe Cushley from Balling The Jack this is a celebration of live blues music not to be missed. Future Juke Festival intends to present some of the finest chairs. Jerron Paxton is still only in 20s, but delves into the deep history of African-American musical traditions and breathes new life into them. He's a multi-instrumentalist: guitar, banjo, piano, violin, harmonica and percussion, who has thrilled audiences globally. An evening with Jerron is a profound education and a joyous entertainment. He was a highlight of the BBC’s recent American Epic series and is a legend in the making. Nia Wyn is a young woman with an extraordinary talent – blessed with a keening country/blues voice and mean guitar-picking skills, she developed her love of roots and soul music sifting through second-hand shops in her native Llandudno. She describes herself as a hip-hop soul in a blues body. Her star is on the rise. Legendary actor/director Steve Buscemi says of Jake La Botz – “He is a true American classic, and a musical resource that is a joy to be discovered time and time again.” Need we say more? The Chicago-born bluesman is a deeply compelling performer who learned at the feet of blues pioneers David ‘Honeyboy’ Edwards and ‘Homesick’ James. His latest album, 'Sunnyside' is a masterclass in rootsy, grooving songcraft. Sister Cookie is an in demand DJ and an amazing soul-blues voice with the stage presence to fill a stadium. She's performed at festivals all over the world, belting out a mixture of originals and covers from the classic eras of swing and R&B with ebullience, class and pizzazz. Chanteuse extraordinaire, Annie Bea helps head up The Rotten Hill Gang and Fjokra (whose fleet-fingered accompaniment also graces Annie's solo performances). Annie is equally at home with punk, funk, prog and jazz – but blues is the natural home for her enthralling, evocative, smokey tones. Young, Eli Paperboy Reed is latter-day soul-blues don. He honed his skills in Mississippi jukes and Chicago gospel choirs. He has the voice of a classic 1960s R&B belter and superb guitar and harmonica skills to boot. He is joined on this occasion by the wonderful, 10-piece High & Mighty Brass Band to make a frankly heavenly racket. Blues-rocker Marcus Bonfanti is one of Britain's very best – a young gun guitarist who will make for fine support. Aidan Connell, Husky Tones and Mudlow represent different strands of the vibrant British alt.blues-rock scene. Connell’s guitar pyrotechnics and scintillating brand of garage-psych has graced stages with Gary Clark Jr and Iggy Pop. His debut album Grio, is a sonic stunner. The frenetic, enthralling Husky Tones are launching their sonic rollercoaster of an EP, I Don't Give A Damn Anymore at this gig. A stand-up drummer and a swaggering, swirling guitarist – boy/girl alchemical punk-rock-blues at its finest. Brighton-based Mudlow’s dusty, gritty Americana is evocative and enthralling. Their new retrospective, Waiting For The Tide To Rise is proof that they are stars in a parallel universe. We are delight to announce that our friends Sid & Jimmy are set to produce and release a new help. But they need your help. After 7 years of developing and playing their own brand of folk music Jimmy Aldridge & Sid Goldsmith are set to produce their 3rd studio album ‘Many a Thousand‘. They have have been busy writing, collecting, arranging and recording for a while now and recently enlisted the help of some incredible musicians to play on the album. This was such a success that they are planning to take the whole band on tour with them when they launch the album through September and October. Jimmy & Sid are self releasing this album which means they need to pay for all the recording/production/administration costs upfront. To help recoup some of this money they are running a crowdfunding campaign where you can pre-order the new album and receive it weeks before the release date. There are a whole load of other rewards available for your support including your very own house concert. Jimmy and Sid will be on tour this summer and you can catch them at Bude Folk Festival, Chester Folk Festival, Fire in the Mountain, Ely Folk Festival, Warwick Folk Festival, and Fieldview Festival. They are then launching their album with a major UK tour, kicking off on 6 September at Kings Place, London. The album, Many a Thousand, is released 6 September. Following her recent singles ‘Landslide’ and ‘Shelter’, the latter of which was played on BBC Scotland, BBC Ulster, Soho Radio, Resonance and Juice FM (Brighton), the Norwegian artist ZIALAND (aka Zia Meyer) will release her new album, ‘Unbridled & Ablaze’ on 8th June. Other highlights on the album include ‘Fever’ (“about living in exile, the vulnerability & precariousness of life in that existence, not knowing what comes next”), the aching ballad ‘Don't Look Down’ (“about a good man losing his partner to illness and his way of loving her is by showing up and being there in all the ways he can”), the powerful ’Shelter’ ("a love letter to my daughter”) and the intense torch song ‘Cleaved’ (“longing for your soulmate, the one you know is out there but not the ‘where’ or ‘how’ or ‘when’ you will meet”). Zialand thinks of the album as being about "‘in-between' moments, when something is ending and something new beginning. That moment where you finally give way to the transmutation. For anything to move and transcend, something else needs to die or be let go of. To me, these moments are imbued with both the deepest of grief as well as a most delicate beatitude and rapture. I think I’ve always been on the hunt for these moments because they are so elusive." ZIALAND is a Norwegian musician, singer-songwriter and producer. Her music is intimate and emotionally charged with a variety of influences such as Joni Mitchell, Peter Gabriel and Billie Holiday. Making her way to LA in her early 20’s to pursue her passion for music, she sang and collaborated with jazz composer/musicians Marcus Miller, Chris Botti and John Beasley, plus bassist Kristian Dunn (of El Ten Eleven). Songs from her debut album gained airplay on key local station KCRW and were placed in indie movies as well as TV shows like ‘Felicity'. However, her burgeoning career as a singer-songwriter stalled in 2002 when she had to leave LA abruptly with her young child due to an abusive relationship, travelling halfway around the world before finally ending up in Australia. But, leaving the hotbed of LA and slipping into the shadows also provided unforeseen opportunities, such as spending more time in various studios, writing and composing as well as learning how to mix. Music became her anchor, “the only thing I could hold on to at times,” Zialand reflects. Finally able to return to Norway a decade later, Zialand released her second album, ‘The Light Below’ in 2014. The majority of it was recorded in Australia while still living in hiding, with the Norwegian trumpeter Arve Henriksen and guitarist Erlend Saeverud helping to give the highly personal jazz tinged record an atmospheric, filmic backdrop. Meeting the British producer/musician John Fryer (Nine Inch Nails, This Mortal Coil, Cocteau Twins, Depeche Mode) resulted in her co-writing two songs for his recent Black Needle Noise project. She also worked with LA producer David Sardy (LCD Soundsystem, Oasis) singing on the score of the movie ‘Bright’ (starring Will Smith and Noomi Rapace), which was released in late 2017. “With all these difficult years behind me, it is nice to finally have the freedom to create and share my music again,” says Zialand. O&O are comprised of Colorado-native, multi-instrumentalist and vocalist, Obadiah Jones, and Israeli vocalist, Orian Peled. “The shared dream of a career in music led us both halfway across the world to the classrooms of Paul McCartney’s Liverpool Institute for Performing Arts (LIPA), where we met for the first time.” While performing together in various projects during their three-year course, O&O established their deep connection as a songwriting partnership and were awarded the unique opportunity of a one-on-one songwriting session with Sir Paul. “Upon graduating and with student visa expiration dates looming, we knew there would be no country where we could both live and work together,” Obadiah recalls. Determined to overcome the bureaucracy, they found an unlikely solution – to live and perform on cruise ships. A six-month stint in the Caribbean ultimately led them on a two-year journey, performing for thousands, honing their distinct sound and learning their craft, while touring far reaching parts of the world, from Alaska to the Greek Isles. This long and winding road led the truly international act to their current home, London, where they hope to become a mainstay in the fast-growing Country and Americana music scene in the UK. Although relatively new to the London scene, O&O have already made their presence felt on the local live music circuit over the last twelve months, with support slots for artists incuding Australian Music Award nominees, the Germein Sisters, and a number of club and festival appearances. Their live show features the duo's distinctive, close-harmony sound with an Americana flare - Fleetwood Mac meets The Civil Wars. Their self-released debut single ‘Traveling’ - with the “perfect harmonies” praised by sites such as The Daily Country and Building Our Own Nashville, showed all the signs of early success, with support across the British music scene, while proceeds from the single and donations raised during a series of pop-up concerts in collaboration with Busk In London and Network Rail went towards raising awareness of national charity Youth Music and its music-making projects for children and young people experiencing challenging circumstances. More recently, the duo were one of the highlights of this year’s Country to Country festival at the O2 Arena, with W21 Music describing their “lovely harmonies”; and one of a handful of acts chosen to record an exclusive Under The Apple Tree acoustic session at the event, aired in a special edition of the show on Chris Country Radio. 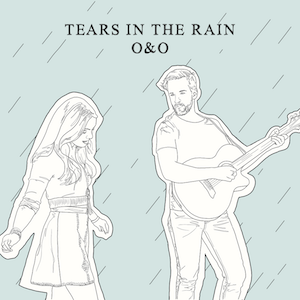 Following the release of previous single 'Some Days' in January, O&O’s new track ‘Tears In The Rain' comes out May 25th 2018, and the duo are set to appear at a number of major UK festivals throughout the summer.